Understandably, Lake Louise in Canada’s Banff National Park gets a lot of the attention. 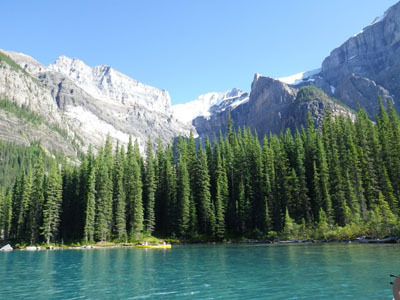 It’s certainly worthy of the many photos taken and time spent strolling along its mile-long shoreline path--probably the busiest path in all of the Canadian Rockies. Clear turquoise water attracts visitors to Moraine Lake. Even though you could spend hours soaking up the glorious mountain scenery and reflections at Lake Louise, don’t overlook Moraine Lake. Located eight miles from Lake Louise Drive, it’s too close to skip and too beautiful to leave off your vacation itinerary. There's also a lodge in case you decide you'd like to spend more time hiking and relaxing along Moraine's shores. 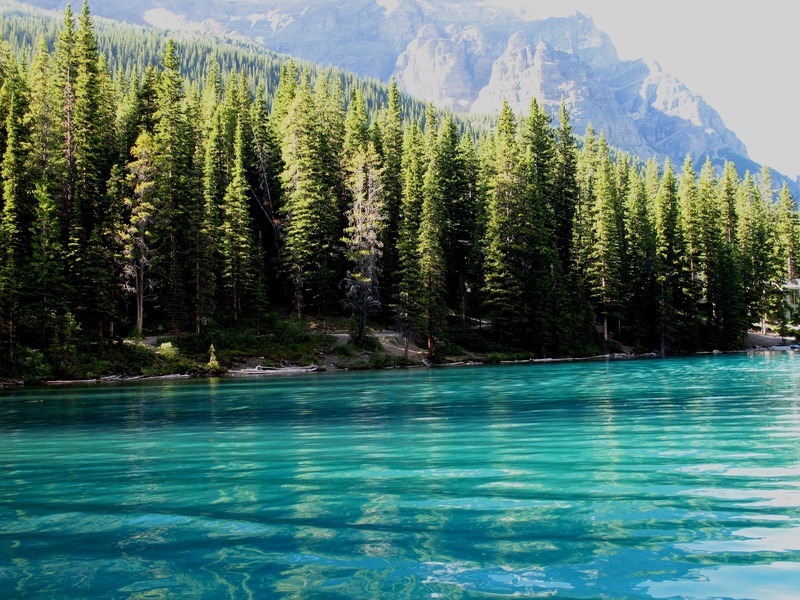 Set in the Valley of the Ten Peaks, Moraine Lake is surrounded by towering mountains, a source of inspiration ever since Walter Wilcox became the first white man to reach its shore in 1899. The lake often remains frozen until June, but during our August visit it was spectacular. 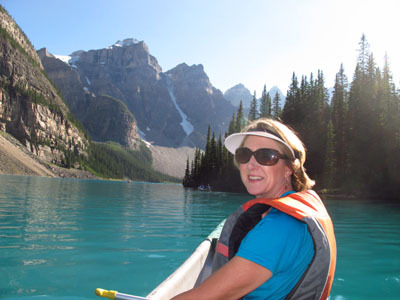 Moraine Lake was our chosen spot for a canoe adventure, a decision reinforced as we glided through clear turquoise water surrounded by stunning mountains. Paddling is easy to the end of the lake, where a small cascade spills into the main body of water. Plan to take your time because you’ll want to stop and admire the mountains (all over 10,000 feet) and maybe even climb the rock pile that forms a barrier along the lake. Stepping carefully on floating logs, half submerged in the water, you’ll feel like a gymnast on a balance beam--until you reach the boulders. 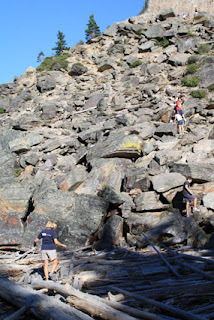 Then it’s a tough climb to the top--a challenge that goads on many visitors, children and adults alike. If you’re not careful, you might end up wet like the kids we saw fall off logs into the cold water. A trail follows the northern shore, and walking there is the easiest way to appreciate the beauty of this alpine lake. The flat trail weaves through shoreline trees and offers incredible views of the 10 peaks, including Tower of Babel, a mountain we especially enjoyed observing while canoeing on the lake. Scattered evergreen trees and an artist’s palate of colorful flowers--tall pink spikes, small white daisies, purple mountain asters, and more created an unforgettable lake and mountain scene.